Large Party Platters serve 20-25 people. Small Party Platters serve 10-15 people. Any of Sassool's salads, dips, sides or hot specials can be added to your catering order to complete the perfect menu for your event. A variety of delicious five Mediterranean cheeses, garnished with olives and wild pickles to create a true Mediterranean delicacy. 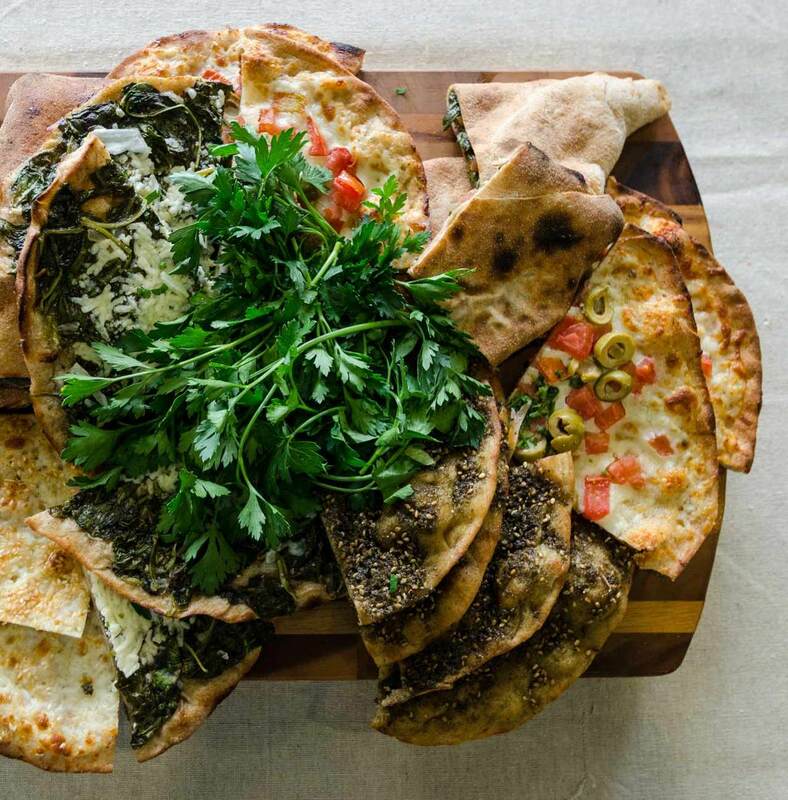 An assortment of our fresh baked pita pizza pies, cut into small wedges. The assortment includes 80 pieces of the following selection unless otherwise requested: Spinach Feta, Tomato Olive, Three Cheese, Meat, and Zaatar. Our delicious home-made hummus and fresh-baked whole wheat pita chips! Your choice of our marinated chicken, beef, or kafta, served on a bed of onions and tomatoes. Priced per kabob. Baked lean ground beef patties made with cracked wheat, pine nuts, onions, and spices, served in bite size pieces with your choice of hummus, baba ghanouj, tatziki or labneh for dipping. Platter has 65 bite size pieces. Your choice of beef and lamb (grilled with onions) or chicken shawarma (grilled with garlic paste), and garnished with tomatoes and Lebanese pickles, parsley and served with tahini dressing. An assortment of fresh julienne vegetables, served with you choice of hummus, baba ghanouj, tatziki, or labneh to dip. Crispy vegetarian patties made from a blend of chickpeas, parsley, onion, garlic and spices. Served traditionally with Lebanese pickles and pickled turnips and tahini dressing. Platter contains 60 falafel balls. A colorful arrangement of seasonal fruit, cut in wedges and decorated to fit any occasion. Our vegetarian baked stuffed vine leaves rolled with rice, diced tomatoes, and spices. Served cold with your choice of hummus, baba ghanouj, tatziki, or labneh to dip. Platter contains 65 pieces. An array of seasonal vegetables roasted to perfection! A tray of our lasagna, layered to perfection with grill squash, eggplant, zucchini, red potato, feta cheese, house made marinara, and a three cheese blend. Tray comes cut into 24 pieces unless requested otherwise. Traditional football shaped kibbeh--lean ground beef patties filled with cracked wheat, onions, pine nuts and spices. Minimum order is two dozen. Priced per dozen. Your choice of turkey, ham, roast beef, chicken salad or tuna salad on our pita pocket bread. Served with cheese, lettuce, tomato, pickles, banana peppers, mayonnaise, mustard, and our house dressing. Sandwiches priced per person. Assorted Mediterranean pastries made with layers of crispy phyllo dough, nuts, simple syrup, and baked to a golden brown. Fresh baked brownies and assorted cookies. Dr. Brown's sodas or exotic bottled juices.